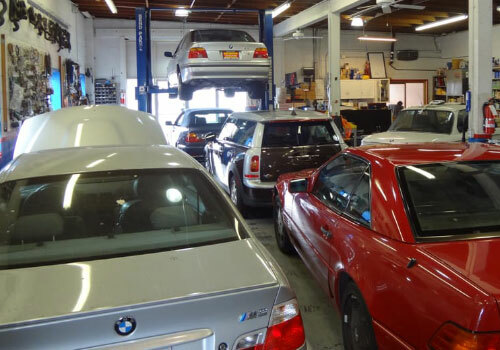 Our goal at Motorsport Division in San Mateo, CA is to provide quality auto repair, quality parts, and outstanding service at a fraction of the price. We started out as a family business and have continued to grow and surround ourselves with a great staff. We offer services to Audi, BMW, Mercedes Benz, Mini, Volvo, Volkswagen, or any other European cars. Our technicians and mechanics have a minimum of 10 years of experience, have serviced over 10,000 customers, and attend training regularly. We use quality OEM parts and stand by our work with a 12 month / 12,000 mile warranty! We give estimates, advice, and general vehicle tips at no charge. Stop by and let us earn your trust. Q.Does my factory warranty remain in effect when you service my car? Absolutely! You receive the exact same coverage. Q. Are you able to service a vehicle as good as a dealership? At Motorsport Division we are able to purchase parts directly from the Original Equipment Manufacturer (OEM) before the auto parts are put into the “BMW” name brand box for resale and save our client’s money on the final repair. By using these parts your vehicle still is covered under the factory warranty, you will get the longest life out of these parts, they will cost less than if you went to another shop or the dealership, and you still end up getting the longest warranty that an auto repair shop offers in the area. And you will NEVER wait weeks for an appointment. We will definitely attend to your vehicle within a couple of days or even the same day if possible. For instance, does a light bulb need changing? We’ll probably be able to fit you in the same day! so you can keep your car on the road. Just an example of better service at a better price. Q.Will you let me know when I need my next service? Yes. Consistent with our emphasis on maintenance and prevention, our computer system keeps track of your service history to make sure you are up to date with maintenance. Q. Will you give me a quote before starting work? Of course. We comply fully with the law which states that estimates must be provided before any work begins. Q. Will you lend me a car while mine is being serviced? Yes. We offer a loaner car during any major auto repair service. For smaller services, we will drive you home or even to the airport if you want to leave us your car while you are away. We’ll even pick you up when the car is ready! We are happy to provide a FREE courtesy shuttle to and from our auto repair shop. Rental cars are also available upon request through Enterprise Rent-A-Car. We try to Our facility is a Repair Pal Certified Top Shop because we met the highest standards in auto repair, auto mechanic competency, reliability of repair, auto repair shop cleanliness, fair pricing, and overall experience. You will notice how clean the shop is due to our commitment to recycling and use of non-toxic substances.In fact, we find that hot water and biodegradable soap work well for dissolving grease on parts.